Just as one new bridge goes up, another comes down! This time it’s the footbridge across Gayle Beck – at the foot of the Cam High Road – that has been removed whilst contractors build the replacement road bridge. The new road bridge is required for logging wagons removing logs from Cam forest. 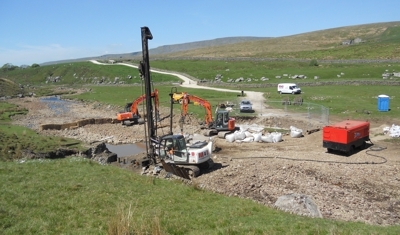 There is an official diversion, which leads walkers off the Cam High Road and along the Pennine Way to Horton-in-Ribblesdale. This is of little use to walkers on the Dales Way. A semi-official diversion is to cross the beck on foot at a ford slightly downstream, but care is needed in wet weather. Many walkers are crossing at some hay bales. As this is open access land, these diversions are legal. Walkers with the latest edition of Colin Speakman’s guide book might consider using the Watershed Alternative route instead, following the Pennine Bridleway down to the Dent Road. The work is expected to continue for another two or three weeks. UPDATE 31/7/2013: The new bridge is now open for use. 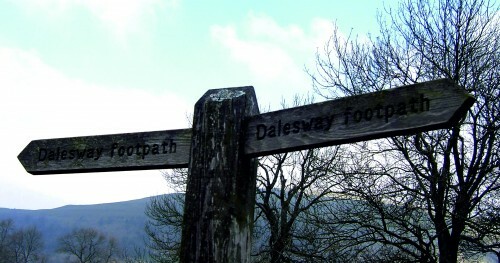 This entry was posted in Footpath and tagged Cam High Road, Dales Way, footbridge, Gayle Beck on June 28, 2013 by DWA. The new bridge at Thursgill is now open to all walkers. The bridge replaces one which was swept away by flash floods last summer, during very heavy rain. 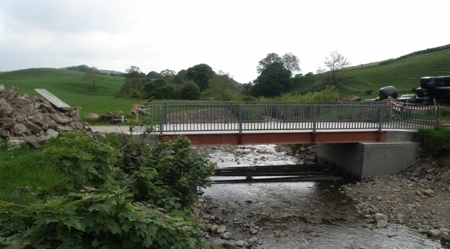 Walkers were originally diverted through Grayrigg and Patton Bridge, along quiet roads. Eventually the farmer constructed a temporary bridge upstream. Though not a right of way, walkers soon began to use this instead. The new bridge is a formidable stucture, and looks set to withstand anything the weather throws at it. There may be some ongoing works to finish it off, so walkers should follow any instructions from bridge workers. This entry was posted in Footpath and tagged bridge, Flood, Grayrigg, Thursgill on June 12, 2013 by Tony Grogan.